SeaWiFS image of the Mediterranean Sea shows smoke over the Bay of Biscay, dust over the central Mediterranean, and a phytoplankton bloom just west of the dust cloud, among. 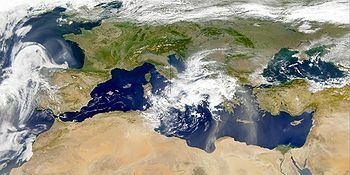 The Mediterranean Sea or "The Great Sea" is a large inlet of the Atlantic Ocean, surrounded by Europe to the north, the Middle East to the east, and Africa to the south. Because of its geographic position, the Mediterranean figures prominently in the commerce and politics of virtually all nations and ancient empires of south and central Europe, the Middle East, and North Africa—particularly those of Rome, Greece, Turkey, Egypt, and the many nations in the areas of Canaan and Palestine, including Israel. Most of the ancient polytheistic mythologies of southern Europe were heavily influenced by the romance and peril of sailing the Mediterranean, including the epics Iliad, Odyssey, and Æneid. This page was last modified on 14 August 2010, at 19:24.